PandaTip: This meeting minutes template makes documenting all meeting topics quick and easy. Use this section to record the meeting date in this template for record keeping. PandaTip: This section of template allows you to record all attendees as well as any votes they may have made in regards to meeting minutes. All votes shall be recorded and obtained for documentation of meeting minutes purposes. PandaTip: This section in the meeting minutes template allows you to fill in any new business that will be discussed during the meeting. PandaTip: This section allows all recurring business discussed during the meeting to be entered into the template and customized each and every time. Meeting Minutes created by [Sender.Firstname] [Sender.LastName] on this date of [Agreement.Date]. Signature below indicates completion of the minutes and authentication of their accuracy. PandaTip: Once all fields have been customized in this template you are ready to send. 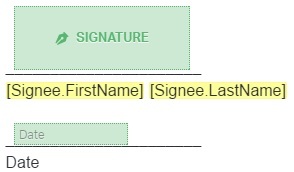 Esignature allows users to sign straight from their computer and allows you to track progress.